Only 2.0 F outer diameter: Very likely the smallest ureter stent currently available. While the inner lumen is sufficiently large enough to pass 0.018″ guide wires. Medical grade and highly biocompatible Nitinol offers superior strength over Polyurethane and much higher visibility in fluoroscopy and X-ray. Laser spiral-cut improves urine drainage flow while being very soft and smooth to enhance patient comfort. Using Nitinol instead of Polyurethane makes it much easier for operator to bypass ureteral obstructions! 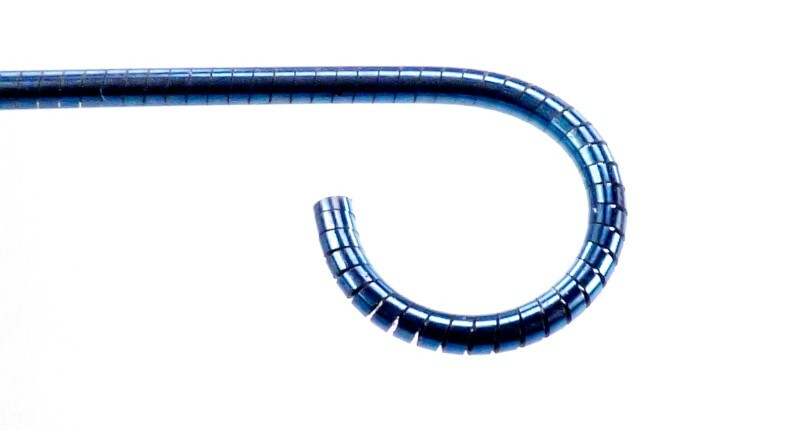 The brand NEW Flexible Nitinol Ureter Stent is part of the DexStent-PU permanent implantable pigtail ureteral stent series and available in precisely 2.0 French diameter which makes it very likely the smallest pigtail stent currently available for cats! Choosing metal instead of weak polymer drastically improves handling and placement accuracy for the operator. The higher strength of the metal alloy allows the operator to bypass severely obstructed passages that would otherwise require surgery. 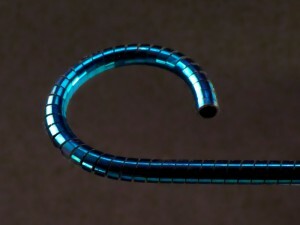 The overall stent design with its unique spiral laser-cut creates a very soft pigtail and stent shaft, the especially smooth surface treatment improves creature comfort and patient life quality. There are no sharp endings protruding from the pigtails that could harm the patient, both stent endings are carefully machined and rounded. The Nitinol metal alloys’ high intrinsic strength also enables thinner wall diameters improving the available lumen for urine flow. 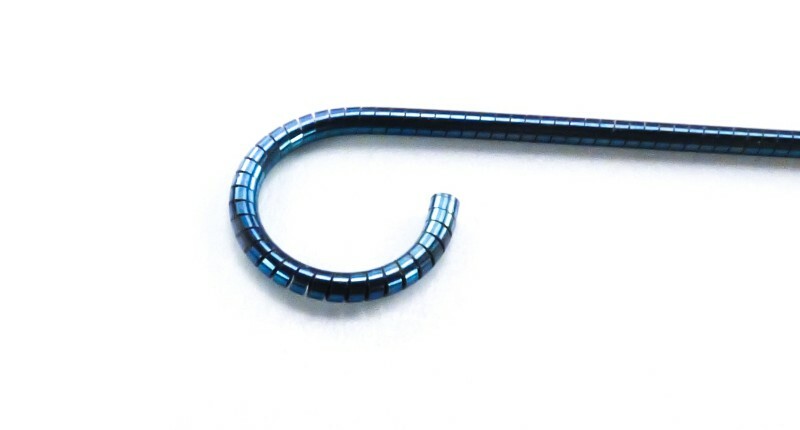 Strong Nitinol also allows for tighter manufacturing tolerances resulting in an overall higher precision compared to polymeric stent materials, therefore saving space while being kink-proof. 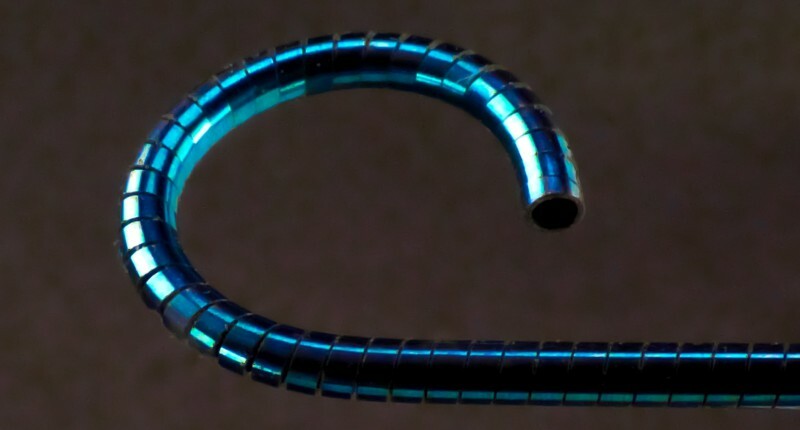 The spiral laser-cut enables to urine to drain inside and alongside the stent helix much better than in tubular designs that feature only half-sided fenestration holes that may even kink the pigtail under certain circumstances. Even at only 2.0 F diameter the stent is highly visible in Fluoroscopy, X-ray or other forms of digital imaging and much much better compared to polymer based stent materials of the same size and diameter. Each set contains the stent and the dilator-pusher. 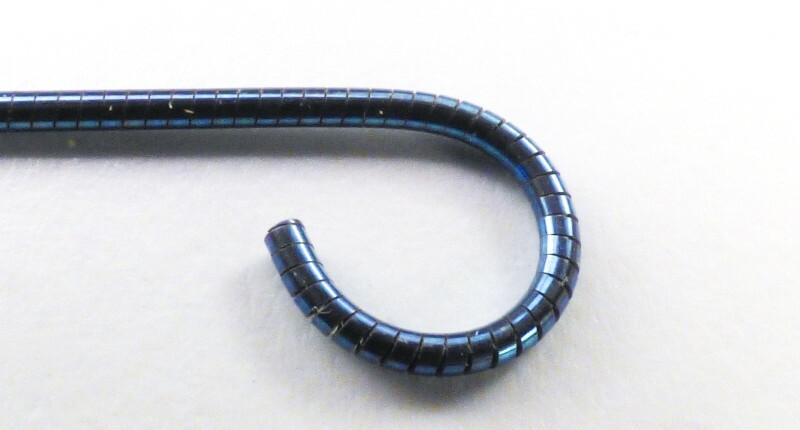 We highly recommend to use 0.018″ Nitinol guide-wires with angle (DexWire) for use with the 2.0 F stents.